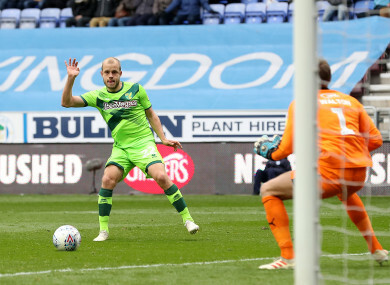 Teemu Pukki scores Norwich's only goal against Wigan this afternoon. Leeds — seeking a return to the Premier League for the first time in 15 years — moved into the second and last automatic promotion spot on Saturday due to a deserved 1-0 win over Sheffield Wednesday. Reece James made no mistake from the spot — although ‘keeper Tim Krul went the right way and got a hand to it — for his second goal in three games. The hosts went close to doubling their advantage in the 65th minute on the counter-attack — after Pukki’s appeals for a penalty had been turned down — saw Leon Clarke turn the Norwich defence inside out but Canaries goalkeeper Krul denied him by getting the slightest of touches to his shot to deflect it away for a corner. Millwall and Reading are also embroiled in the fight to avoid filling the final relegation spot — Bolton look destined to join Ipswich Town in the third tier as they are 10 points adrift of safety. Email “Pukki's late strike edges Norwich closer to Premier League return”. Feedback on “Pukki's late strike edges Norwich closer to Premier League return”.